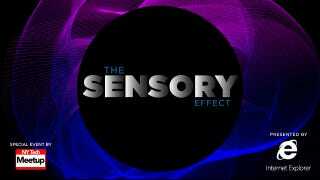 Tonight at 7:30 PM ET we'll be livestreaming Danfung Dennis and Ray Kurzweil speaking at The Sensory Effect, a special NY Tech Meetup all about the latest in gesture/sound control in partnership with Gawker Media, presented by Windows Internet Explorer. Email sensory@gawker.com to receive the password to watch the livestream in its entirety. Come back next week for a full recap with photos of The Sensory Effect, and head here to download Windows Internet Explorer so you can see and hear the web at its most beautiful.